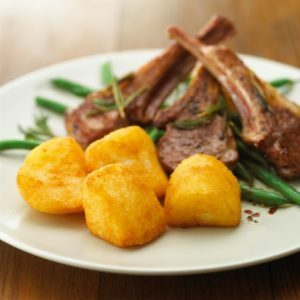 We recently had a review on Trip Advisor which noted our “deep fried, frozen ‘roast’ potatoes”. Oh dear, Irene S, I’m afraid you couldn’t be further from the truth. We have never, nor will we ever, use deep fried frozen roast potatoes. We don’t use any frozen vegetables. We prepare seasonal vegetables to accompany main courses. As I’m in a generous mood, I’m going to share our recipe for roast potatoes. Our aim is to create roast potatoes that are golden and crisp on the outside, and fluffy on the inside. 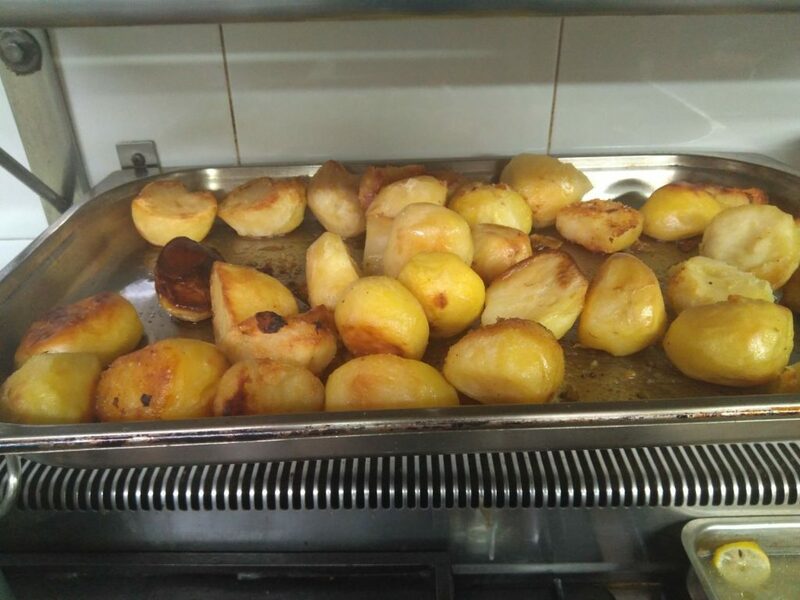 No mean feat when we are preparing upwards of 300 or 400 roast potatoes for our Sunday Lunch service in Torrevieja. When you are parboiling potatoes to be roasted at home, add a splash of lemon juice or vinegar to the water. This helps to prevent them from splitting apart. If you want a crumbly effect on the outside, lightly dust with flour after boiling and before roasting. Start with a floury potato, not a waxy spud. Peel the potatoes and cut in half, lengthways. Simmer for about 12 to 15 minutes. Drain and return the pan to a medium heat. Shake the pot around for a minute or so, to remove excess moisture and ruffle the outside edges a little. Place the potatoes in a roasting tin and drench in oil. Sprinkle with salt, and toss. Make sure the potatoes are evenly spread in the tin. Do not cover! Place in the oven and bake for 1 hour. Check regularly, and shake frequently. At the hour mark, reduce the temperature to 150°C. Roast for a further 30 minutes. That’s it! Now they are ready to serve at their best. 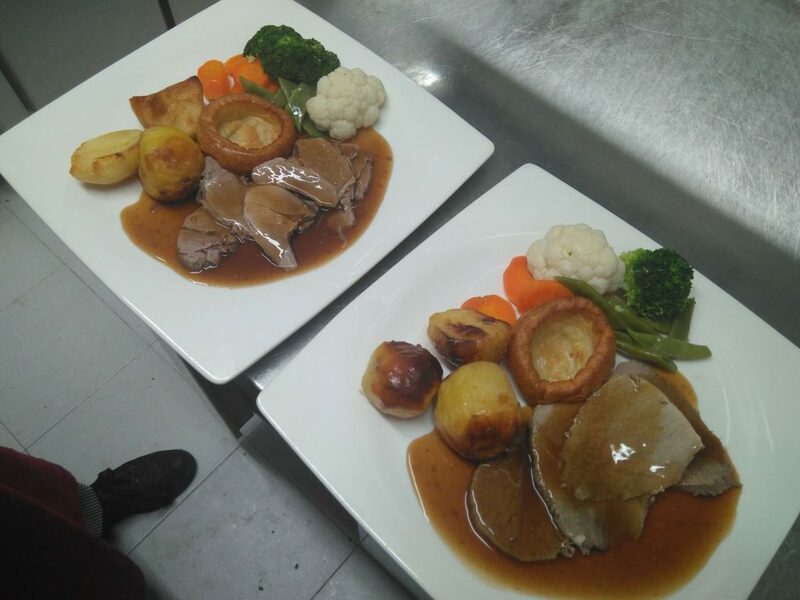 Your part of the bargain as a Sunday Lunch diner at Christopher’s? Turn up on time! We cook our roast potatoes to order. They are best served at the time for when we anticipate your main course to be served. If you’d like to sample our roast potatoes to see if you agree with Denise or Irene, we strongly advise you to book so that you are not disappointed. To do so, call us on (+34) 600 01 28 24. Irene S. – Next time you’re tucking into Sunday lunch at a restaurant, look for the classic signs that your roast potatoes are oven roasted. As you’ll see from the photo below (from the website of a big brand maker of frozen roast potatoes), the tell-tale signs are a more uniform shape, size, and uniform colour around the ‘roasted’ potato. Now compare this photo with the photos of our golden roast potatoes in the roasting tin, ready to be served, and plated up.